Augsburg College was recently selected by the Carnegie Foundation to receive the classification for Community Engagement. This classification affirms that a university or college has institutionalized community engagement in its identity, culture, and commitments. It also affirms that the practices of community engagement are aligned with the institution's identity and form an integral component of the institutional culture. There are three categories in the classification: curricular engagement, outreach and partnerships, and a category for both curricular engagement and outreach. Augsburg received the classification for both curricular engagement and outreach and partnerships. In Minnesota, the University of Minnesota, University of St. Thomas, and Winona State received the same classification in 2006; Metropolitan State University and Augsburg were the only institutions to receive the classification in Minnesota in 2008. In a letter to Augsburg President Paul C. Pribbenow, Jim Scheibel, executive director of the Minnesota Campus Compact, congratulated the College on this recognition. Scheibel wrote, "...as a country that faces an economic crisis, and as a community that witnesses division and strife across the globe, we need students, faculty, and campuses that are fully engaged. This recognition says you are doing your part and acknowledges that you are serious about fulfilling the mission of the College." Augsburg has included "student engagement" as one of nine specific academic goals for the institution. The Augsburg Experience signature curriculum requirement encourages direct involvement with people and organizations external to the college, first-hand discovery and application of knowledge, self-awareness through reflective and critical thinking, and exploration of what one is called to do in the world. Augsburg is a committed partner to particular non-profit and educational groups within the urban neighborhoods surrounding the College, including Cedar-Riverside, Seward, and Phillips. Some of these key partnerships have been nurtured for over twenty years. These partnerships provide opportunities for students to engage in hands-on service learning, internships, and work study. In addition, President Pribbenow and his leadership team have instituted programs and policies that support community engagement for the entire campus community. All staff members now have two days of additional leave time available specifically for community service activities. 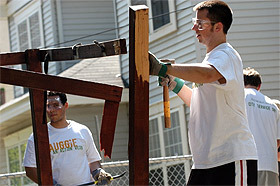 A campus service day was launched in 2008. Augsburg has become a leader among area higher education institutions in participation in local United Way and Community Share federated campaigns. Go to the Carnegie Foundation website for more information about the Community Engagement classification.